HP Connected Photo is a free Windows 8 photo app. 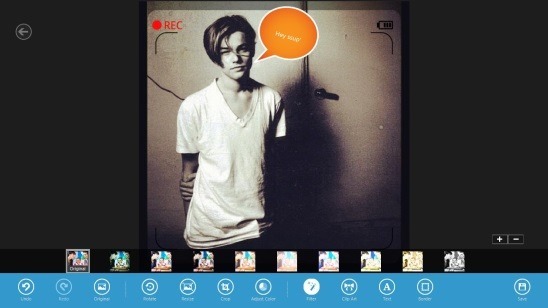 Using this app you can view, edit, upload, and share photos stored on your hard disk. It gives you options to get your Facebook and other social networking accounts connected to the app. Once they get connected, you can use photos from these accounts as well. This app is powered by Snapfish, which is a web based photo sharing and photo printing service. It brings social networking, photo editing, and photo sharing experience together at one place. Since the app is supported by Snapfish, you can upload unlimited photos using this free photo app. 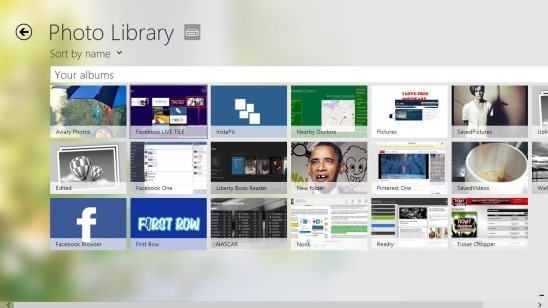 Besides that, you can also use the Windows 8 Search, Share, Settings, and Print Charms. 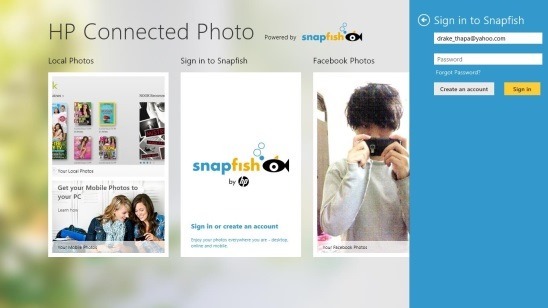 The app also lets you access photos, which you have uploaded in the Snapfish cloud. You can get more information on Snapfish, here. HP Connected Photo is a good free Windows 8 photo app to view all your photos, add effects and enhancements, and share them with your friends. You can get this free app under the Photo Category in Windows Store. If in case, you won’t find the app in the Windows Store, then you can use Win + Q keys to search for the app (within Windows Store) or use the link at the end of this article. Like I said before, the main idea of HP Connected Photo app is to let you easily view, edit, and share your photos with friends. And I can say that the app totally meets this intent. The app is functional, easy, and has a very good & clean user interface. You won’t find any ads within the app. Everything is well categorized and well designed. Nothing is vague. Switching between different screen and scrolling through the app is smooth and quick. By default the app accesses the Pictures Directory of your hard Disk. Besides that you need to login with your Snapfish credentials to get access to the photos uploaded by you in Snapfish Cloud. Although besides Facebook, the app supports Renren and Sina Weibo, but these two websites aren’t of much use to most of the users, because they are basically Chinese social networking websites. But yes the app does supports Snapfish! Which is a one biggest advantage of this free Windows 8 photo app. 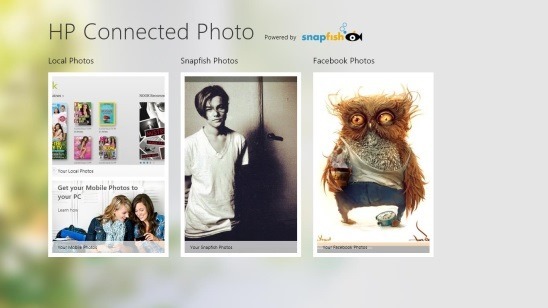 You can not only get access to the Snapfish photos but the app allows the unlimited cloud storage. Therefore you have plenty of space to upload photos to. So no need to get concerned with the data storage space. Once you connect to Facebook using your Facebook credentials, you can access and view the Facebook photos. You can also edit the Facebook photos directly from the app, without having to download and edit them separately. This is another good feature that makes the app really handy and fast. The different editing options includes: Resizing, Cropping, Rotating, Color adjustments, borders, speech bubbles, and some awesome filters. Once you are done with enhancing the photos, you can save them on your hard disk, or in the cloud itself, and share them with friends using the Share Charm. Good free Windows 8 photo app. Good and easy photo editing options. Supported with Windows 8 Charms. Live tiles at the Start Screen. 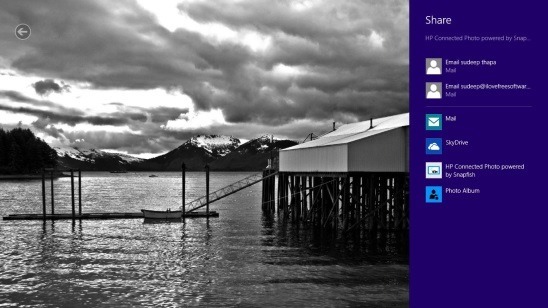 HP Connected Photo is a good Windows 8 photo app to try your hands on. It’s all for free. Working on a fine looking interface is always a good experience. It’s probably one of the easiest way to view photos, add cool enhancements, and share them with friends. Also check out this free Windows 8 photo app we reviewed earlier: Image Effect. Get HP Connected Photo here!